Turn your grill to high heat. Brush the grates with olive oil or vegetable so the corn doesn't stick. Place the corn on the grill, rotating them every 30 seconds or so to ensure even cooking/charring. Cook until the corn is browned and lightly charred. Transfer corn to a large serving plate. 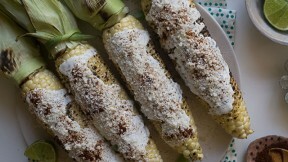 Top each cob with a tablespoon of crema, a liberal sprinkling of cotija cheese and a few pinches of Ancho chile pepper. Garnish the plate with a few wedges of lime and cilantro leaves. If you'd like to make an Elote Salad, cut the kernels off the cob. Transfer them to a bowl. Add the Mexican crema, cotija cheese and ancho chile pepper. Toss the entire thing together and salt to taste. Feel free to adjust any of the seasonings further. If you'd like, you can finely chop the cilantro leaves and fold those in as well. Serve with lime wedges.